There were more than 500 Native Nations in North America when European settlers arrived. In what can justifiably be called a genocide, millions of native people died after contact and by the late 19th century there were a mere 250,000 of them left in the territory of the United States. Today, native peoples only hold a tiny fraction of their original lands and many of them were dispersed and fragmented into minute reserves or reservations. For example, in Canada alone there are over 630 of them. Victor Trempano (native-land.ca) has embarked on an impressive webproject mapping the original native lands. The map of traditional homelands illustrates that the US-Canada border is a division that was superimposed on existing cohesive native lands. Where members of indigenous communities could once freely walk, drive or paddle to see relatives, hunt, fish, gather wild rice or berries, visit burial grounds, collect holy medicine, or attend spiritual gatherings, there is now a line that interdicts passage. The border is enforced and marked with stone monuments, often in a clear-cut strip of forest, along the entire 5,525 mile swath that separates the United States from Canada. Since 9/11, the line is even more securitized with sensors, drone surveillance, checkpoints, fences and other obstacles. 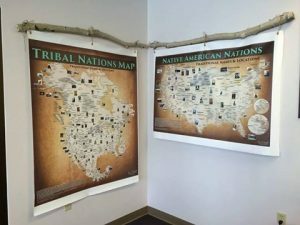 The Native cartographer Aaron Carapella creates wall maps of the traditional homelands of tribal nations in the Americas identifying them by their own names.